For the past month, we've been having issues with our well. We think it all started with a lightning strike that fried the entire system - the well pump, storage tank pump, and all the wiring. After having everything replaced, we thought we were all set. Until I turned on the faucet one day and only a trickle came out. We were out of water - again! They determined that the same lightning strike which had destroyed the electrical system and pumps had also damaged the well and caused it to cave in. (Our house is like a giant lightning rod sitting up here on top of the hill!) Unfortunately, after cleaning out the well, they still weren't getting any water. Things were looking bleak. Since we don't have public water here, if the well doesn't produce water, our only option is to drill a new well, an even more costly proposition than what we were already going through. 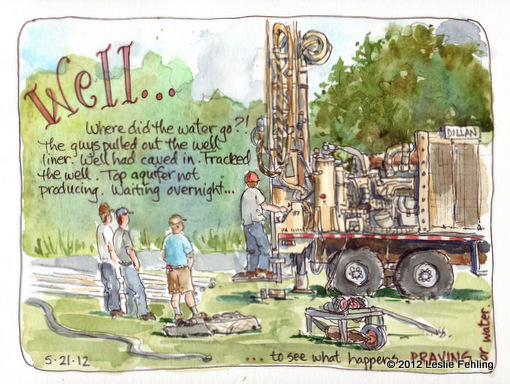 We were praying for a good outcome, hoping beyond hope that something would happen to bring the well back to life. The next morning Jeff, the well guy, normally a serious man of few words, came to me with a big grin on his face, almost giddy with excitement. He said the main aquifer had opened up during the night and was flowing like a river - the well was holding over 450 gallons of water. What a miraculous turn of events! Our water is back. Hallelujah! 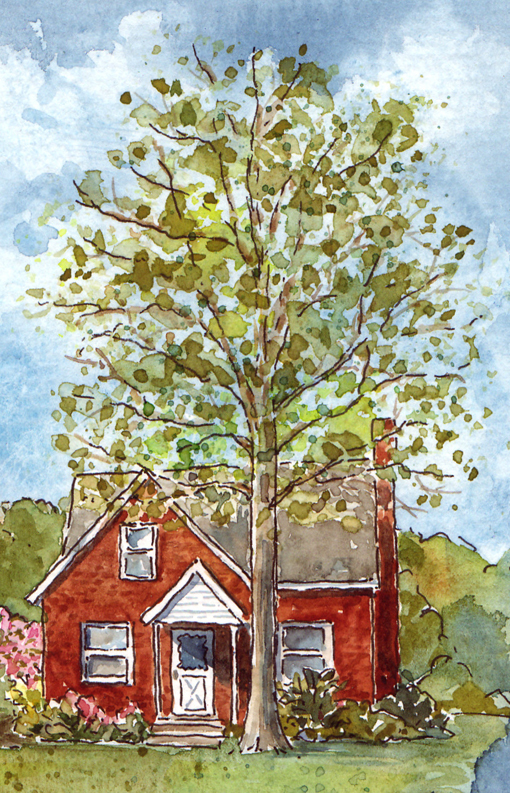 Step-by-Step Watercolor Painting: "My Own Sweet Time"
This post is a behind-the-scenes glimpse into my sometimes focused, often haphazard, approach to painting the watercolor shown above. If you don't care to read all the details, just scan through the pictures, but if you're like me, you might find it interesting to see how one person's way of working differs from your own. 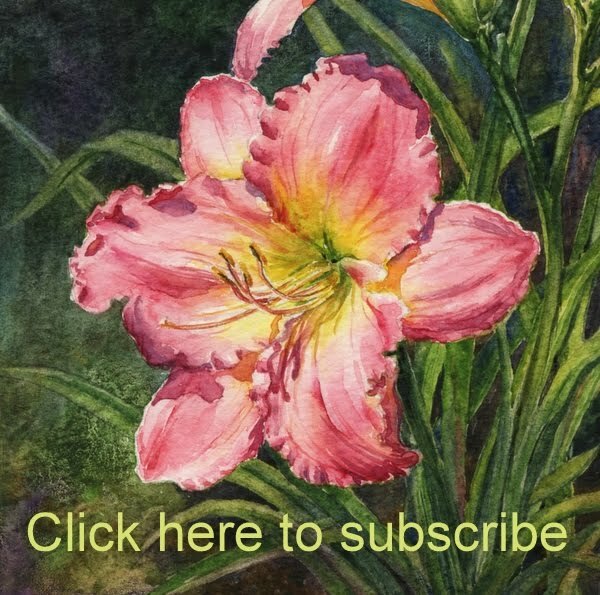 In early April, our local art league's spring show deadline was fast approaching. I wanted to enter a few pieces, but since most of my work is done in sketchbooks, I don't have a lot of finished paintings lying around. I like to keep my sketchbooks intact, so I decided I needed to do a brand new painting for the show. I had attended a bridal shower a few days earlier, and was lucky enough to win one of the pretty floral centerpieces, so I decided I'd set up a still life using that as the focal point. Since I love antique blue and white china, I thought I'd include a blue willow tea cup and saucer, along with a couple of homemade cookies. I needed a few other things to round out the composition, so I pulled out some old family silverware and added some sugar cubes, which I think are just so cute and real, a throwback to the days before Splenda and Equal. I arranged everything on a vintage white cutwork tablecloth and got to work. 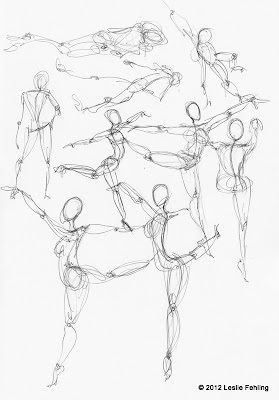 I sketched the composition on a sheet of 140 lb. watercolor paper in pencil. For the tea cup, I just indicated a general idea of the main motifs. No need for a lot of detail at this point, but it was important to get the symmetry of the cup and saucer right. I began to ink the lines using a Faber-Castell Pitt Artist's Pen with superfine nib. The floral arrangement was first. When I got to the tea cup, I found that it was easier to turn the paper around and draw the arcs upside down, since the swing of my arm corresponded to the shape of the line I was drawing. After I inked the flowers, tea cup, spoon, and sugar cubes, I stood back and took a good look. I didn't like the large blank area in the upper left corner of the composition. It was way too empty and uninteresting. After mulling things over for a few minutes and dismissing several possibilities, I decided to add a stack of books from my art library. 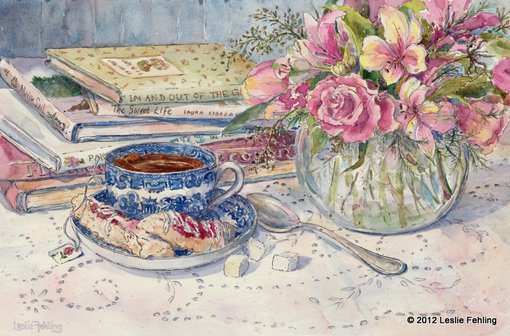 The lines of the book covers would help to lead the eye into the painting and toward the flowers, plus they added to the theme that was beginning to take shape - tea, cookies, art books, taking a break, relaxing. When approaching a painting like this, I'm never quite sure where to begin. I just pick a spot and get some paint down on the paper, so I can begin to judge my colors and values. Here I started with the background, then the topmost book and a few touches on the others. Then I put some initial washes on the tea cup, and a few spots on the flower arrangement. I had to be careful to paint around the branch of foliage that extended out into the background. I had daylight coming from a window on the left side of the arrangement plus overhead fluorescent lights, but I supplemented it with an incandescent light on the left to give me consistent shadows no matter what time of day I was painting. Having the light source closer to the subject also helped to make the shadows stronger than the diffused light from the window did. I laid down a light golden wash on the tea cup and the cookies to give them a warm glow, then began painting the tea. There was a strong reflection of the top book showing up on the surface of the tea, and at first I painted it as I saw it, but as I kept working, that slash of light color bothered me. It looked odd and didn't seem to read true to what it was. I eventually got rid of it and was much happier with the look of the tea. I dove into the flowers next, putting in some light washes, midtones, and a few spots of dark green. I tentatively began painting some of the stems showing in the glass vase. I haven't painted glass much at all, so I'll admit I was intimidated by that part of the picture. But I figured I'd just look really carefully at what was in front of me, and paint what I saw, just as I was doing with the flowers and the books and every other part of the picture. The only way I was going to learn was to give it a try. It's better to challenge myself and attempt something new than to always avoid painting that certain something that makes me nervous. 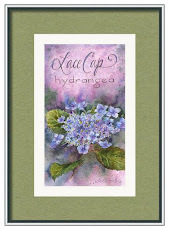 I used a variety of techniques on the flowers, sometimes painting successive layers of color, other times painting wet-in-wet and allowing the colors to blend. At this point, I added more color to the stack of books and to the silver teaspoon. The spoon had a silvery grey base color, but I could also see reflections of colors from the china, the books, and the flowers in it. For now, I simply put down a few of the blue-grey shadows. The books were fun to paint. In the stack I had a couple of instructional books about painting flowers (gee, it might have been a good idea to read over them before I started this project!) 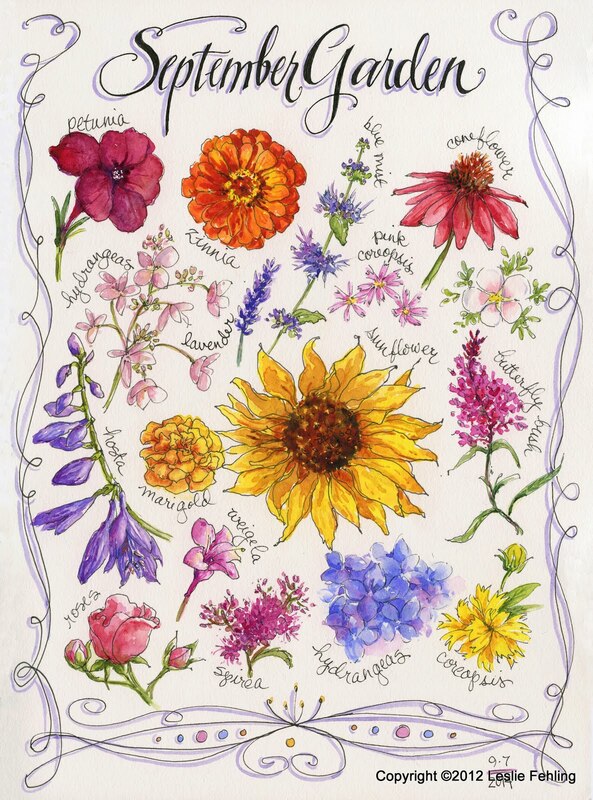 plus The Sweet Life by Laura Stoddard, In and Out of the Garden by Sara Midda, and Maine Sail by Margaret S. McCrae, all illustrated memoirs which are fun and inspirational. Adding the shadows really made the books pop. It's like magic! Things can look flat and dull, then I paint on some blue-grey shadows, and they suddenly have depth and dimension. I indicated the tiny fruits and vegetables on the cover of the Midda book very simply with squiggles and dots of paint. When I'm painting in my home studio, I use a John Pike art palette. Its 15" x 10-1/2" size gives me a large mixing area which I find essential. 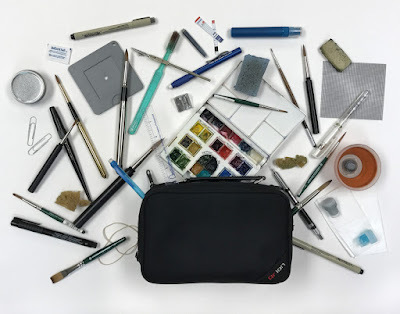 It has a tight-fitting cover that helps to keep the paints moist, and, when they do eventually dry out, I just spritz them with water to make them usable again. Having a large mixing area enables me to keep certain color mixtures on my palette to use over again. Repeating colors in a painting helps to lend continuity. I clean off sections of the mixing area periodically, though, so my colors don't combine too much and get muddy. I primarily use Winsor and Newton watercolor paints, with a few American Journey colors thrown into the mix. Next, I tackled the raspberry strippers (see the recipe here) and got around to fixing the reflection on the surface of the tea. Looks better, don't you think? I love that little shadow of the tea bag string that falls across the cookie. I was still avoiding doing the blue pattern on the tea cup - I had to psych myself up for that a little later when I was adding the finishing touches to the painting. Next I added the pine trees and island on the cover of the Maine Sail book. Then I worked on the spoon a bit more, finishing the handle and adding a hint of reflections in the bowl. The sugar cubes and tablecloth were given a few pale shadows, with stronger ones under the spoon. I sure hop around the picture a lot, don't I? I was surprisingly happy with how the vase was turning out - it had just enough detail to show some stems, but looked abstract enough to convince the eye that there was water in there. It was even beginning to look like a glass vase! Yay! I worked on the flowers continually, adding splashes of contrasting color or spatters of paint, and darkening certain areas. As the painting progressed, I focused on details like buds and stamens. Subtle washes of pink, yellow, and blue were painted on the tablecloth to take away some of the stark whiteness and repeat the colors of the blooms. Shadows were added under and behind the vase. More subtle shadows were added to the tablecloth to indicate fold lines, and I painted the Red Rose tea tag, along with the shadow falling on the saucer and tablecloth. I like to include little details like the tear on the paper tag and the way the string goes under the staple. I just get a kick out of that stuff. With just a little squiggle of a line, I can turn a generic paper tag into a particular one, the one that happened to tear when I pulled it apart to dunk in that pretty tea cup. Those quirky little details make artwork come alive. Finally, it was time to dive in and paint the blue and white pattern on the tea cup. It turned out to be a lot of fun. When you're not trying to paint with photographic realism, you can roughly indicate a pattern or suggest a motif and not worry about it looking perfect. Even though I suffer from severe perfectionist tendencies, I really love painting in a more sketchy style like this. It seems so much more interesting to leave things to the imagination of the viewer rather than revealing everything in an obvious way. After painting the pattern on the china saucer and darkening some shadows, the painting was almost finished. All it needed was a few final touches. A branch of small-scale greenery finally took its place against the background where I had earlier saved white space for it. Lacy fronds of filler greenery were painted where they fell down over the glass vase. There were some in the water, too, and they were painted with more subdued colors and less detail. The embroidery and cutwork on the tablecloth were suggested with blue-grey shadows, adding much-needed interest to the foreground. Washes of blue and cool pink tone down the lower left corner. A hint of a warmer tone on the right side helps to balance the warmth of the cookies and books on the left. I painted the pattern and shadows on the saucer. I love the casual look that spatters give to a watercolor painting. I try not to overdo it, but I tend to think that they usually improve a painting, giving it added interest and texture. Looking at the painting critically, I decided that the area in the upper left really needed to be beefed up a bit. It was looking pale and washed out. I mixed up some puddles of deep, rich blues, greys, and toned-down purples, and brushed them onto the beadboard background. It helped the background to recede and the books to push forward. Ah, the painting was finished at last and ready for framing! My still life was still sitting where I had arranged it days before, but now the roses were limp and droopy, the lilies were shriveling up, and tulip petals were dropping onto the table. The tea was like mud, and the cookies hard as rocks. 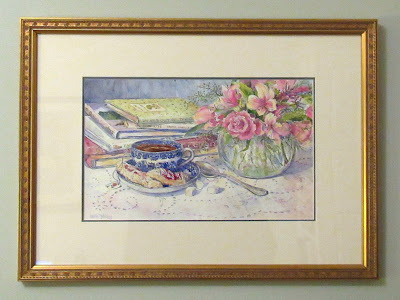 But in my painting, they will always remain fresh and beautiful, inviting me to stop for a spell, open a book, dunk a cookie, take a deep cleansing breath, and sip my tea. If you're in the Pittsburgh, PA, area this week, I hope you'll take a few minutes to stop by The Galleria in Mt. 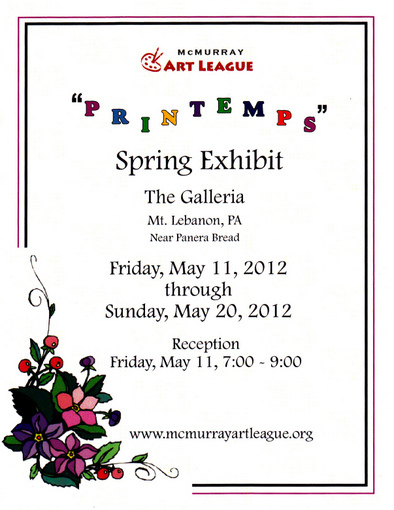 Lebanon to see the new spring art show sponsored by the McMurray Art League. 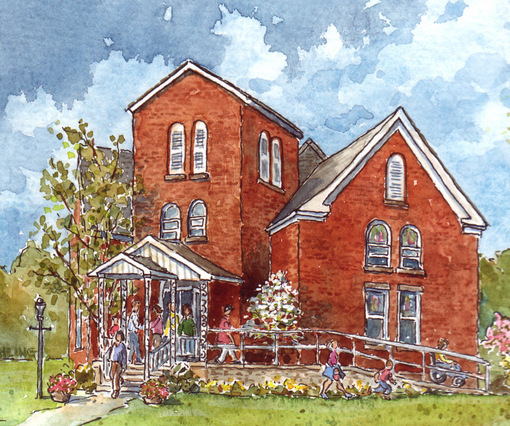 Over ninety drawings and paintings by league members are on display until this coming Sunday. I have three paintings in the show. 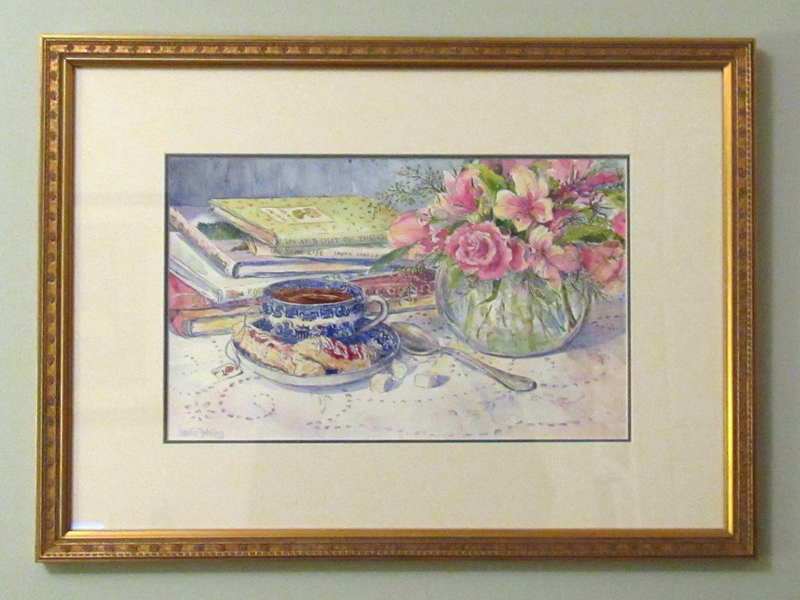 The first is a recent watercolor called "My Own Sweet Time". I took lots of photos while painting it, to illustrate the step-by-step blog post I'm working on for you. I should have it completed soon. 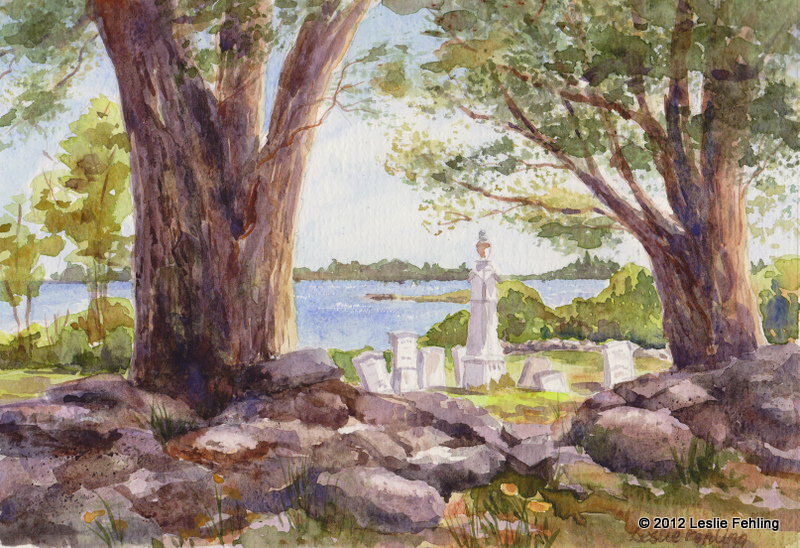 The second piece is "Pemaquid Sentinels," painted on location at Fort Pemaquid near New Harbor, Maine. "Idle Hours" is my final entry. It's a dreamy, Impressionistic scene of a dozing cat whiling away the afternoon. 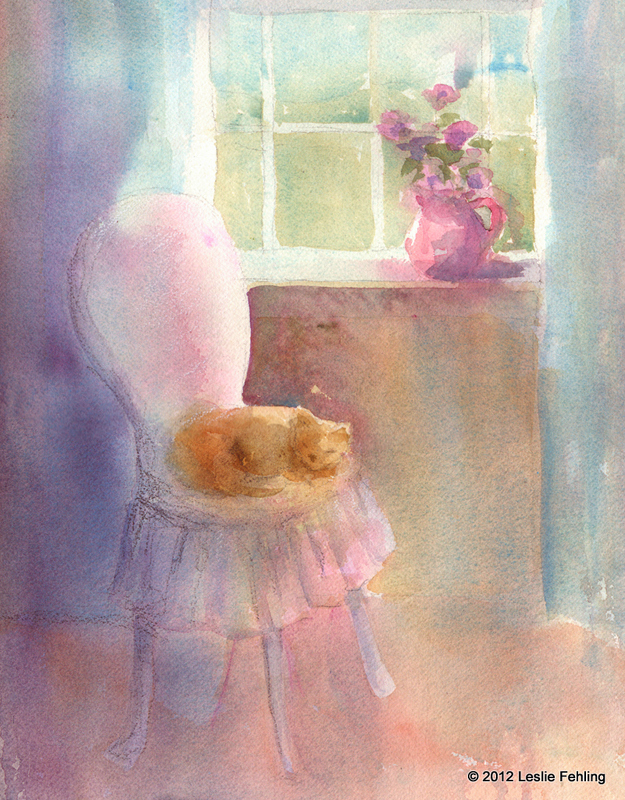 Cast your vote for Viewer's Choice while you're at the show, and be inspired to do some summer painting of your own! In the little town of Jefferson, nestled among the rolling hills of Greene County, Pennsylvania, lives an extraordinary man named John Dorean. 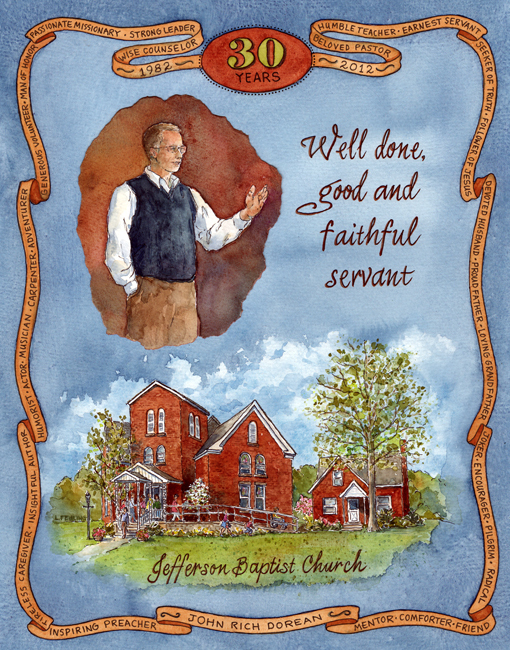 This past Sunday, we celebrated his 30th anniversary as the pastor of Jefferson Baptist Church, and I presented him with a painting that I made as a tribute to his years of service to his congregation and community, as well as to countless people whose lives he has touched across the country and around the world. 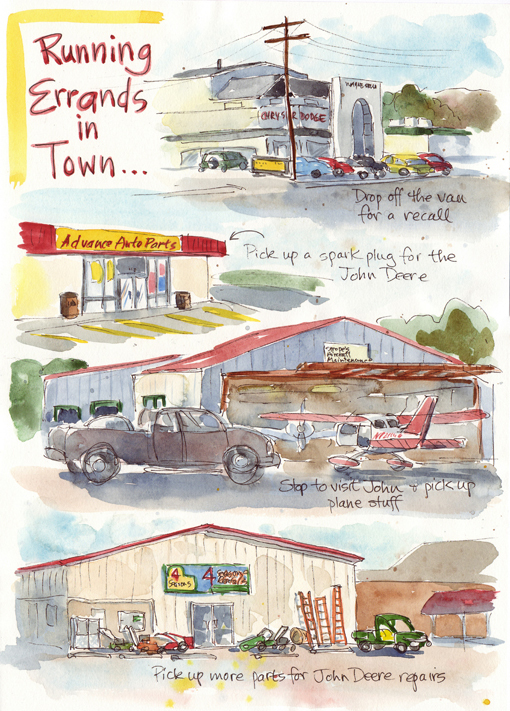 When I began to plan the painting, I intended to somehow document all of John's accomplishments over the past three decades, no easy feat considering how much he has been involved in. 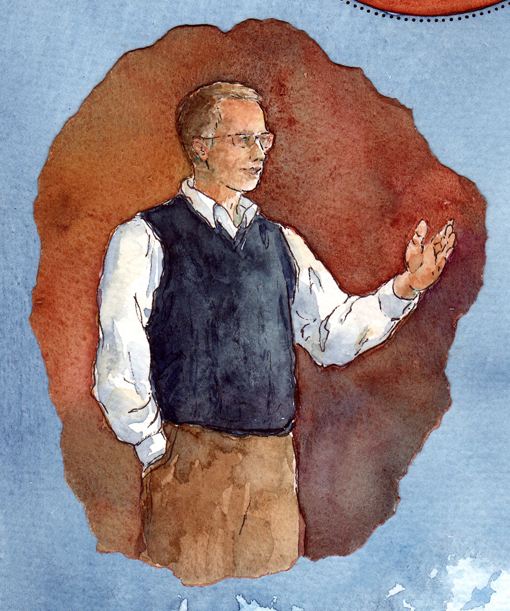 As I began listing his church activities, mission trips, and board memberships, as well as the books he's written, awards won, and honors received, I realized that there was no way to include it all in an 11" x 14" painting. I definitely needed to rethink things. But one thing I was sure of was that I wanted the painting to feature a picture of the church and the parsonage, as well as a portrait of John. So, one Sunday a few weeks ago, I very sneakily took pictures of Pastor John as he preached, and then, after the service, snapped a few more from across the street, as he greeted people on their way out of church. I now had my reference photos, and could proceed with my sketches. I included lots of people in the church sketch, and if you look closely, you can even see the Dorean's daughter, Bethany, whizzing down the ramp in her wheelchair. I also added some spring flowers to brighten things up a bit. I indicated the bricks on the church and parsonage with strokes of burnt sienna and burnt umber, but didn't get too caught up in painting every minute detail. I like how the sketch of the Dorean's home turned out. It looks so cozy and inviting. I had one teeny problem, though, when it came time to paint Pastor Dorean. My reference photos weren't very helpful at all. The low light in the church had made the pictures kind of fuzzy, and John was sporting a beard in the photos, but had shaved it off soon after I took them, giving him an entirely different look. With my deadline looming, it was too late to take more pictures, so I did my best with what I had. The painting of John's face is only about 3/4" high, so it was especially challenging to get a reasonable likeness. I painted him on a separate piece of watercolor paper, then tore out the painting to get an interesting rough edge and glued the finished portrait onto the background. From the first moments of thinking about this painting, I knew that Matthew 25:21 was the verse I wanted to use. It sums up everything we feel about this man who has dedicated himself to God's work for all of his adult life. After taking some time to mull over my dilemma about how to include in the painting all that John has accomplished, it slowly dawned on me that I needed to stop looking at things superficially. 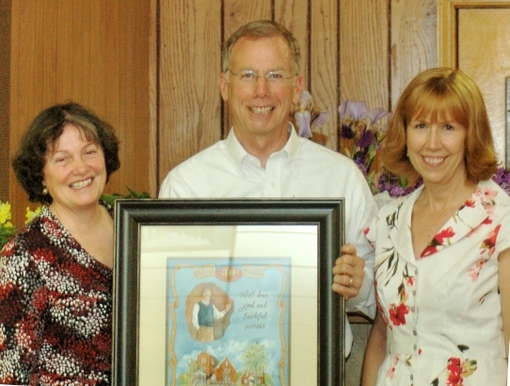 We weren't honoring John Dorean for leading a Bible study or founding our local Habitat chapter or any of his other good works. 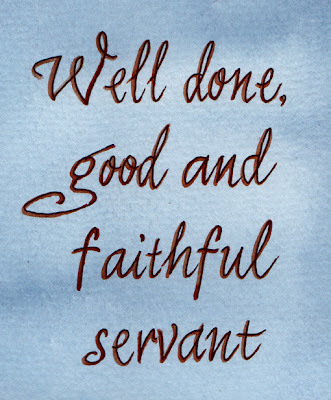 We love him because of who he is, not what he's done. On Sunday, amidst all the laughter and tears of his 30th anniversary celebration, I finally got to present him with his painting. I know he was surprised, and I think he was touched by the sentiment. I hope whenever he looks at it, he'll remember how many people appreciate, admire, and love him. He's a very special man, and we're blessed to have him as our pastor and friend. I've been working on some very detailed painting projects lately, which I'll share with you soon, but it's gotten me in the mood to do something looser and quicker. So, this morning when I had to drop my van off at the Chrysler dealer for yet another recall repair, I brought my sketchbook along for the ride. My husband picked me up, so I wouldn't have to hang around the waiting room, and we did errands until the van was done. 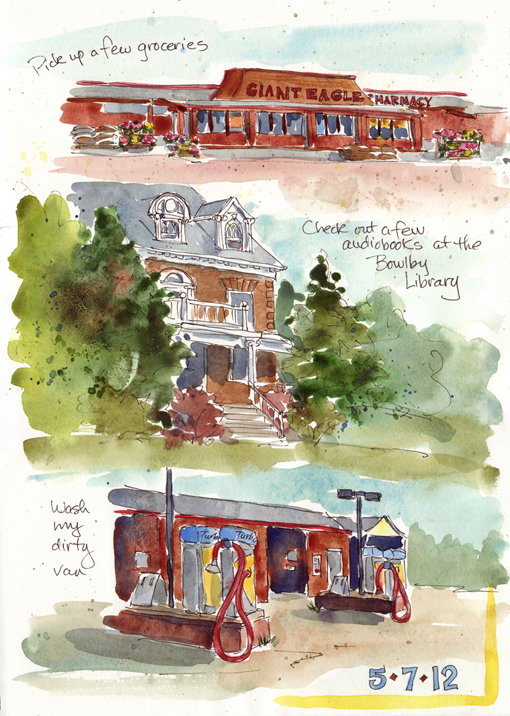 By the time the van was finished, I'd filled two pages in my sketchbook with line drawings. Each of them only took a few minutes, and it sure did help to pass the time. I made one last stop at the car wash, then headed home to splash some color onto my sketches. What could have been a dreary morning of trying to tune out the sports channel on the waiting room television, turned into a fun sketching session. The paintings may be rough, crooked, and inaccurate, but, gee, I had fun! This is what everyday art is all about. Weird Proportions, Funny Noses, Crossed Eyes... 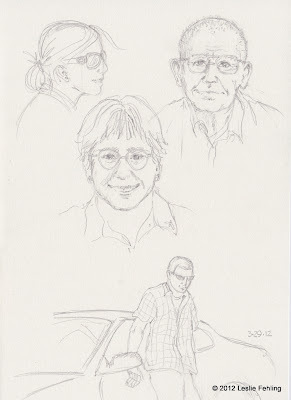 It Isn't Easy Drawing People! 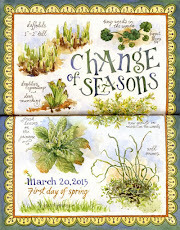 My sketchbooks are filled with pictures of flowers, landscapes, and everyday scenes from around my home. They even include quite a few sketches of our cats and dogs, but one thing that's glaringly obvious is that I don't draw people. There's a whole big part of my life that I'm afraid to draw. I can get away with inaccuracies when sketching a flower or a landscape or even a building, but when drawing figures, errors are obvious, and that makes me uncomfortable. So, for the most part, my sketches are people-free. It's just easier to leave them out than to risk messing up a perfectly good sketch by adding some weirdly proportioned guy who will only end up being a distraction. But this bothers me. I don't like being afraid of things. So I've decided to do something about it! I'm going to tackle the problem head-on, and try to get back the skills I had years ago. 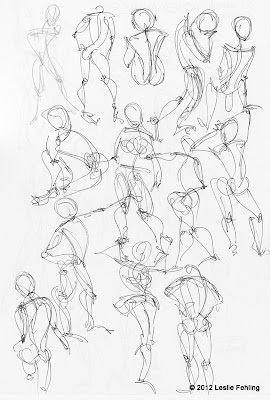 When I was an art major in college, we spent hours in life drawing classes, learning to render the human form in an endless number of poses. 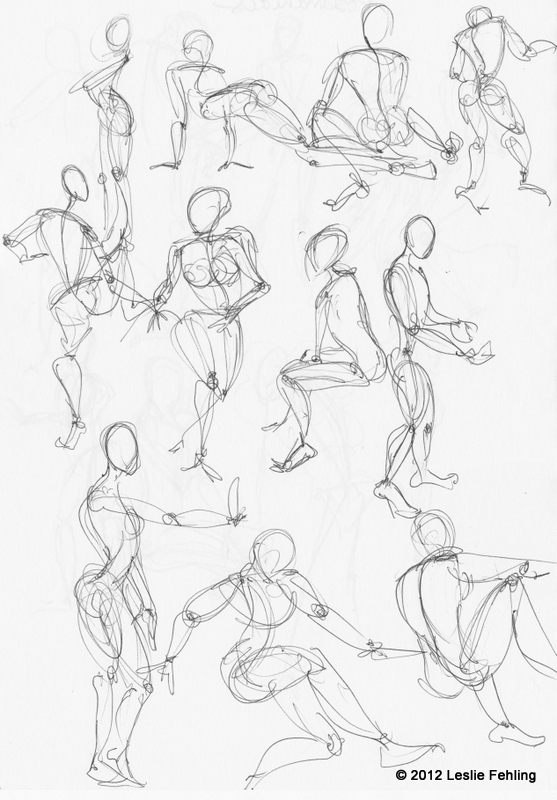 It was time well-spent, and that familiarity with drawing people gave me the confidence to approach figure drawing without the fear and trembling that I'm feeling these days. My lines were sure and strong, rather than tentative. I'm determined to get back to that level of skill and confidence! 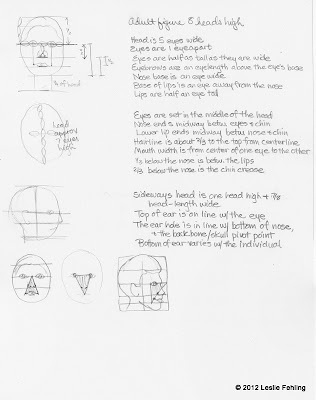 To start, I went online and found a website with information about proportions, then did a reference drawing in my sketchbook as a reminder of what the guidelines are for drawing a face. 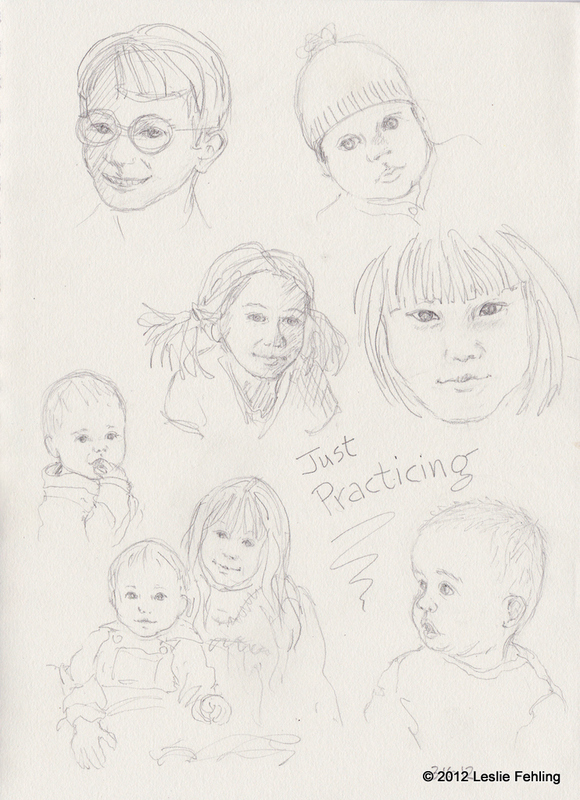 I did a couple of practice pages, filling them with faces and trying to get the proportions right. 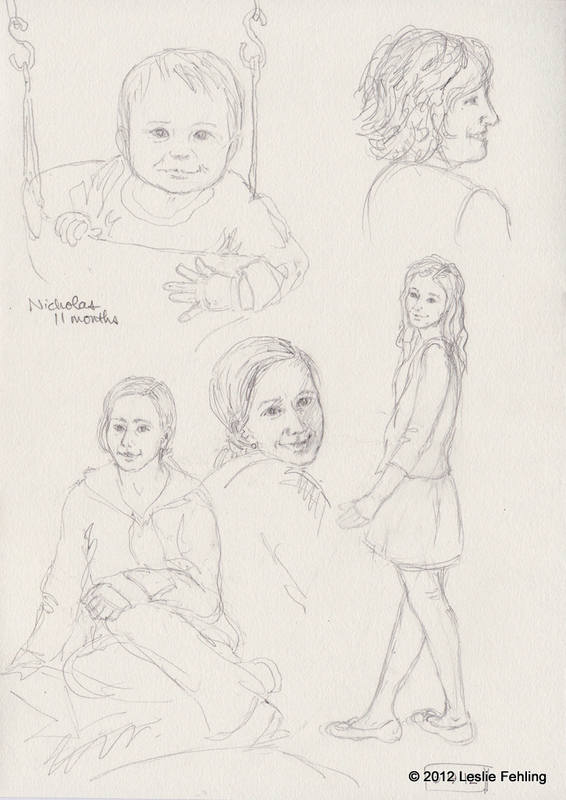 I started out using some Google images of faces to draw from, then tried sketching from some photos of my family. These may not look too bad, but they're the end result of a lot of erasing and redrawing. I've realized that, when drawing faces, the slightest little line can turn a smile into a grimace or make a kid's nose look like a pig's nose! 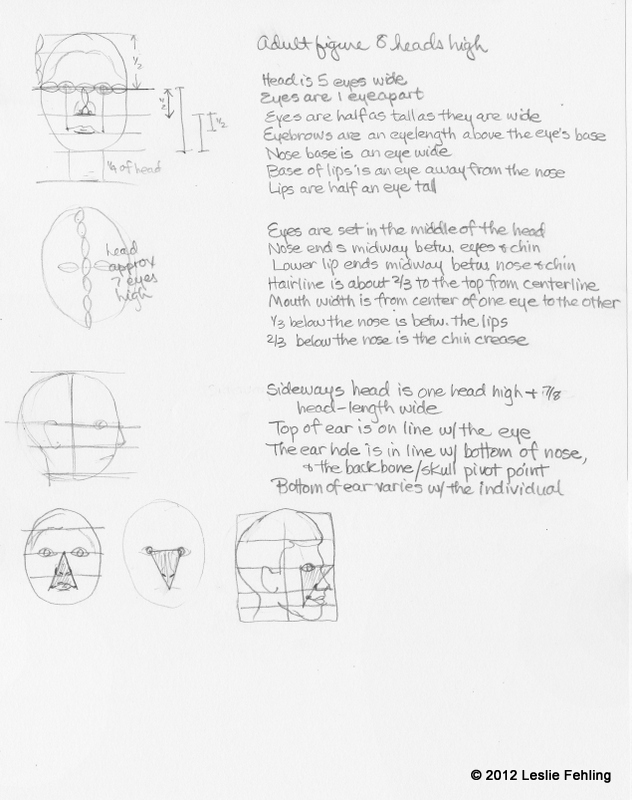 Getting both eyes the same size and looking in the same direction is trickier than it would seem. Sheesh! This stuff is a lot harder than drawing trees and mountains. 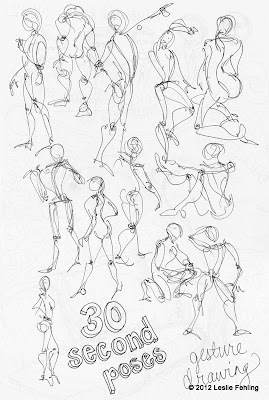 To loosen up and get over some of the timidity I feel when approaching a life-drawing, I periodically head over to Posemaniacs.com to practice with their 30-second poses. 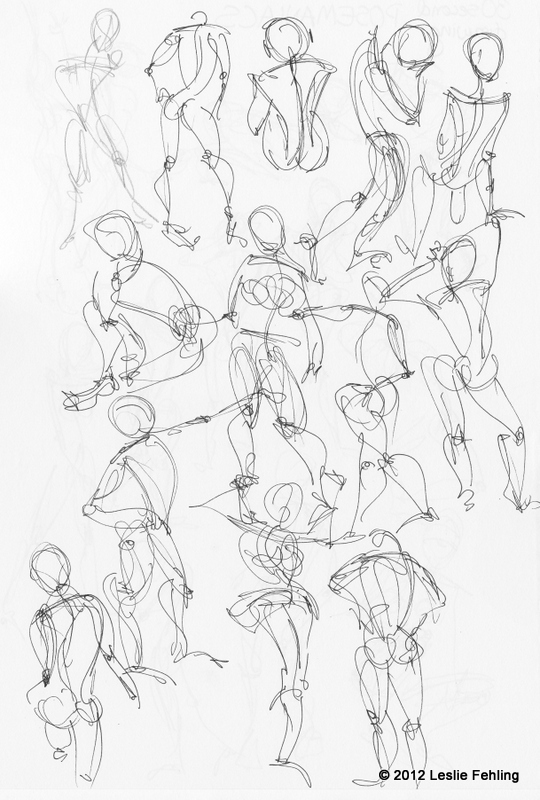 The computer-generated figures strike some incredibly contorted poses, but that keeps things interesting. 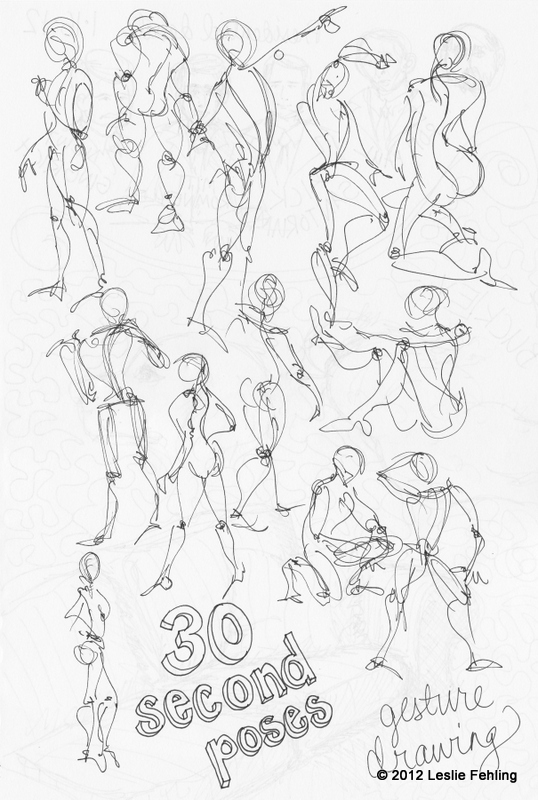 And with only 30 seconds per pose, I'm sketching so quickly that it becomes intuitive. I don't have time to fuss over things. After just a few minutes of drawing, I start to get into a rhythm and begin to see improvement. 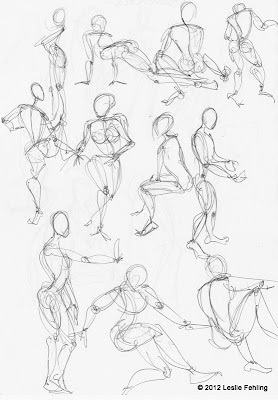 A quick gesture drawing is all there is time for. Some of them are flops, but some really seem to capture the essence of the pose. They're a lot of fun. The website is free - hop on over and give it a try. 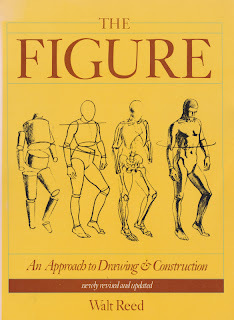 I also bought a good basic book about figure drawing, entitled The Figure, by Walt Reed. 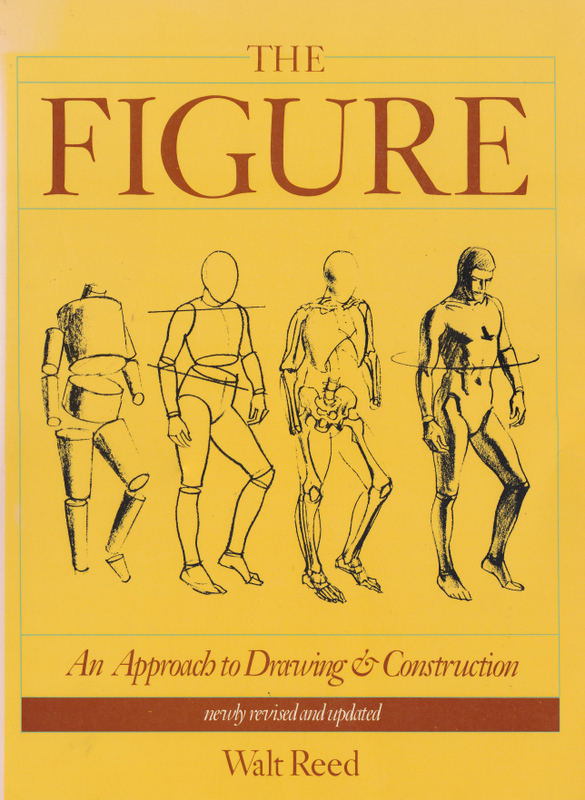 I'm reading it cover to cover, then plan to go back and work through the exercises. I'm hoping this will give me a good foundation to build on. I guess the real key to becoming comfortable drawing people is to practice, and practice, and keep on practicing. 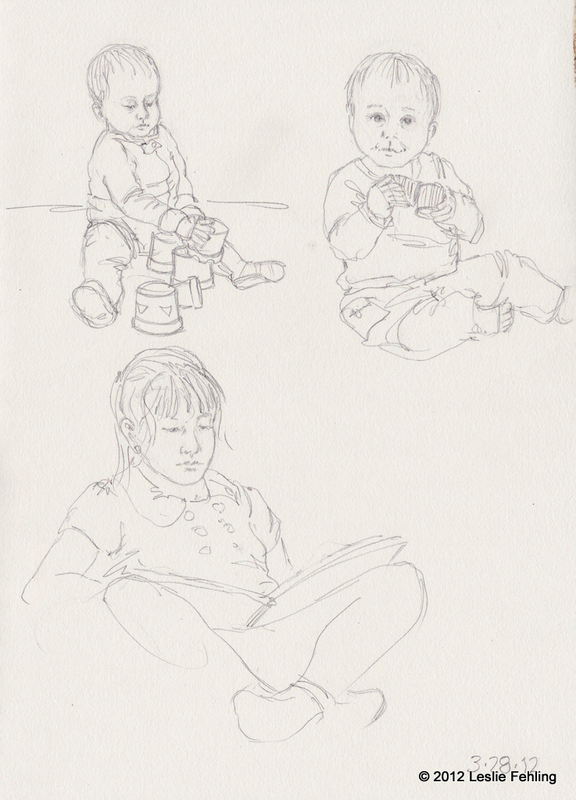 Filling pages and pages of my sketchbook with quick sketches will do more for me than laboring over one drawing and trying to get it perfect. It may take awhile to reach my goal, but I'm going to work on it. I'll share my progress with you.